These Vanilla Sugar Cookies make a great holiday cookie, they’re perfect for adding icing and candy but are also delicious plain. I only started making cut-out cookies a few years ago. The kids look forward to using the cookie cutters and then decorating the baked cookies with a variety of candy. And for my youngest, it’s an opportunity to eat more candy, which is really her favourite part! These Vanilla Sugar Cookies make a great holiday cookie, they're perfect for decorating with icing and candy but are also delicious plain. In the bowl of a mixer, cream butter and sugar on medium speed until light and fluffy, scrapping the sides of the bowl at least once. Reduce the speed of the mixer and add the flour, baking powder and salt. Mix until well blended. Remove the dough and divide it in two parts. Form a disk with each half and wrap it with wax paper or saran wrap. Refrigerate for at least one hour. Position a rack in the middle of your oven and preheat the oven to 350°F. Line baking sheets with non-stick baking liners or parchment paper. When ready to start, remove one disk from the refrigerator (leave the other one in until you are ready to use it). Between sheets of waxed paper (or on a lightly floured counter), roll out the dough to 1/4-inch thickness. With cookie cutter, cut out shapes, and place cookies onto baking sheet, 1 inch apart. If the cookies are breaking as you move them you can use a spatula to move them onto the baking sheet. Gather the dough scraps and re-roll, cutting as many cookies as possible. Bake, 1 sheet at a time, until pale golden on bottoms and edges, about 10 minutes. Let cookies cool for a couple of minutes on baking sheet before moving onto racks to cool completely. 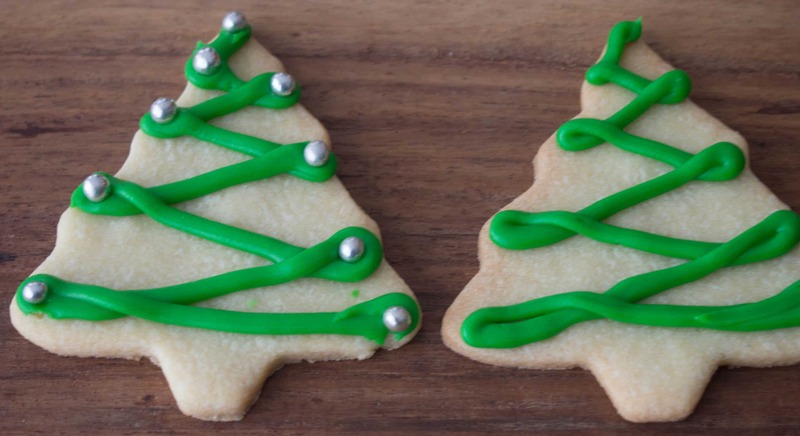 The baked, undecorated cookies can be stored in an airtight container for up to 5 days and can be frozen for up to 1 month; thaw cookies in the refrigerator before decorating. 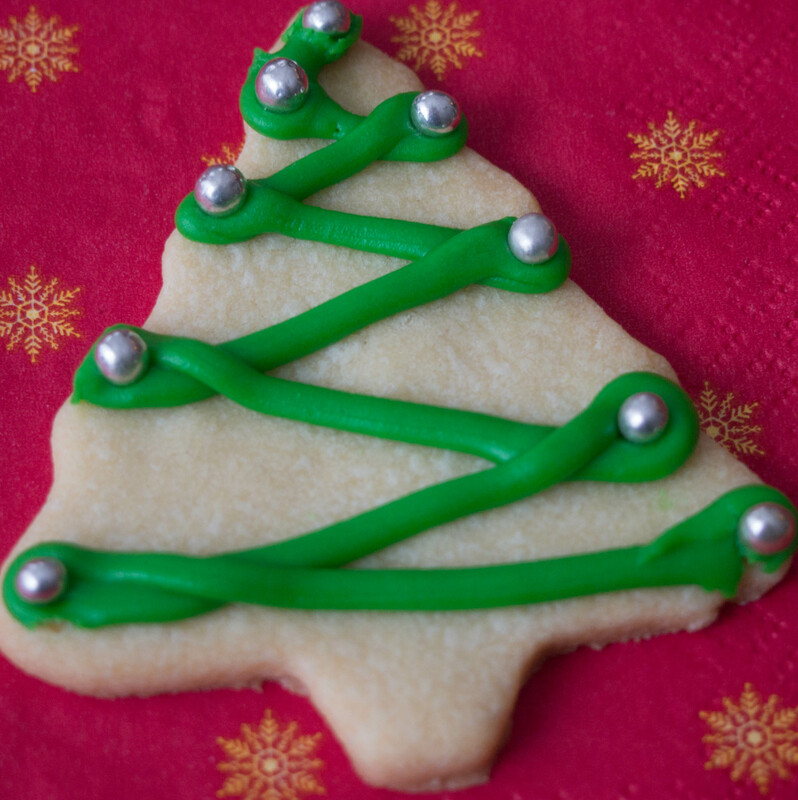 Once cookies are decorated they can be kept at room temperature for up to 3 days. I decorated the cookies using leftover royal icing that came with our ready to assemble gingerbread house. Make sure you add the candy (I used dragées) before the royal icing sets. Let the cookies sit on the rack until the icing is set, about 3 hours. Store the decorated cookies, in single layers between waxed paper in an airtight container or a pretty cookie tin if gifting them. The preparation time includes the time the dough rests in the refrigerator. I would like to try these… They look good. You should, they are very good and lots of fun to decorate!